A peanut butter and banana sandwich can be a snack or meal that contains healthy fat, carbohydrates and protein. 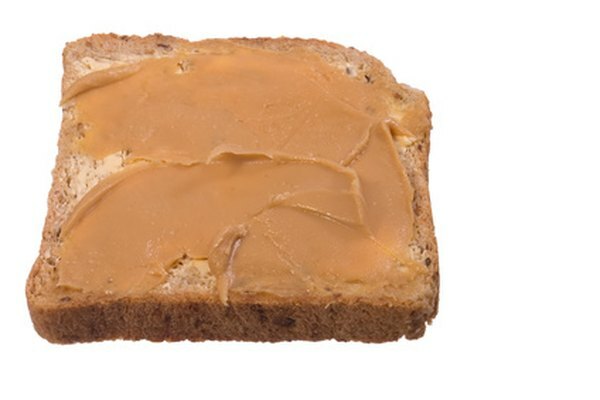 The taste is why the king, Elvis, enjoyed eating this sandwich regularly; however, various types of peanut butter and bread can change this healthy sandwich into a diet-busting sugar bomb. When you choose the bread and peanut butter for your peanut butter and banana sandwich, pay attention to the product's calories, macronutrient breakdown and ingredients. Reading your labels will help you decide if a certain brand of peanut butter has too many grams of sugar or if one type of bread has little to no nutrients. Making informed choices can significantly improve the nutritional value of your sandwich. The bread is the foundation of a peanut butter and banana sandwich. If you're trying to lose weight, aim for low-calorie organic bread. Processed breads with refined grains, simple sugars and bleached flour are usually stripped of their nutrients. Bread that is 100 percent whole wheat will provide your body with fiber, nutrients and protein that will keep you satiated and boost your metabolism. A typical piece of bread has anywhere between 80 and 120 calories per slice. A banana is a low-calorie fruit that is packed with vitamins and fiber. This portion of the sandwich will help to satisfy your sweet craving, and it also adds a fruit serving to your day. Bananas vary in calories based on their size. A small banana, 6 inches in length, can have 90 calories, whereas an extra large banana, 9 inches in length, can have up to 135 calories, says CaloriesInABanana.net. Peanut butter offers healthy fat, antioxidants and protein to the sandwich mixture. Organic peanut butter usually has the same amount of calories as brand name peanut butter, about 100 calories per tablespoon, but it will save you from added chemicals. In fact, organic peanut butter is a healthier choice because it does not have as many added sugars, is higher in protein and contains beneficial compounds such as folate, according to the Michigan State University website.